You could replace the natural yoghurt with an equal quantity of your favourite vanilla yoghurt and leave out the syrup and extract, or substitute with coconut yoghurt for a dairy-free treat. For a thicker yoghurt bark use a smaller pan. Dice the papaya – chop half finely (1cm pieces) and the other half roughly (2-3cm pieces), you should have about 2 cups total. Combine yoghurt and vanilla in a bowl. Add syrup or honey to taste, then stir through half the finely chopped papaya. Spread papaya yoghurt mixture over the prepared pan in an even layer. Top with raspberries, pistachios and remaining papaya. Freeze 2 – 4 hours until firm. 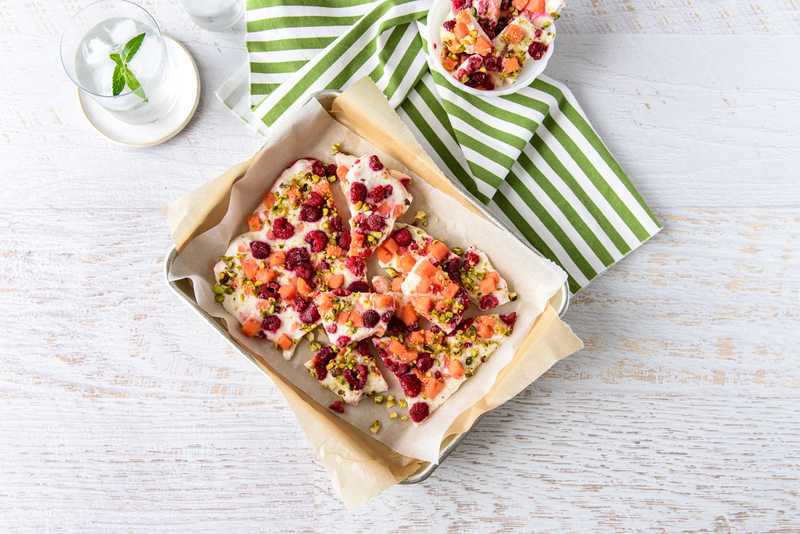 Cut or break yoghurt bark into bite-sized pieces and serve immediately, or store in a freezer bag for a quick treat.